Homebrew PCB Masking: Sharpie FTW! The big rectangle at the top will heatsink the main p-MOSFET power switch, which shouldn’t dissipate much power at all. The two lower rectangles heatsink the n-MOSFETs, although I think they may each require a stand-up metal tab to handle the dissipation during high-duty-cycle blinkiness. 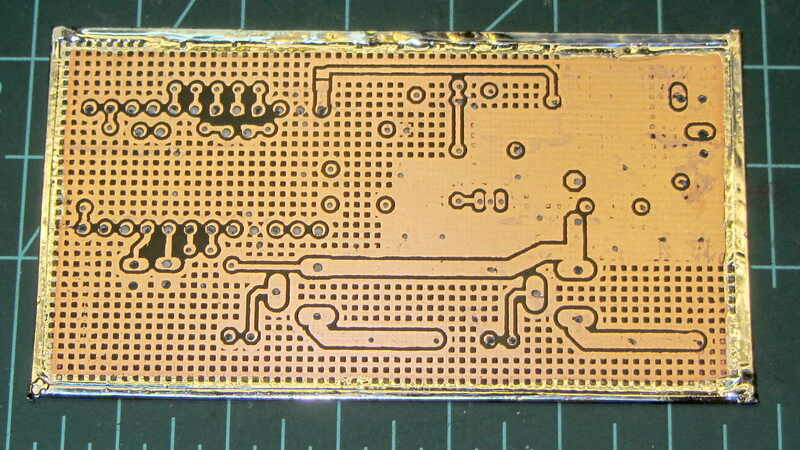 The silver line around the edge is soldered copper foil tape connecting the top and bottom ground planes; a dozen or so additional Z wires will connect the planes at high current nodes. It’ll get a bunch of flying signal wires, too, because I’m not a fanatic gotta-embed-all-the-wires kind of guy on stuff like this. The PCB is 30 mil FR4, which (once again, I make this mistake over and over again) seems a bit bendy for surface-mount parts; I must print a simple nest to stabilize the poor thing. Some of the drilled holes look white, because I hadn’t rinsed out the remains of the silver plating powder; the surfaces are a lot more silvery in person. I think it probably wouldn’t matter either way, but nothing exceeds like excess. FWIW, I use the grid pattern as a way to verify the end of the board etching: when all the holes in the ground pour come clear, all the traces are done, too. It’s etched with ferric chloride, rubbed with a sponge, and took under ten minutes on each side. 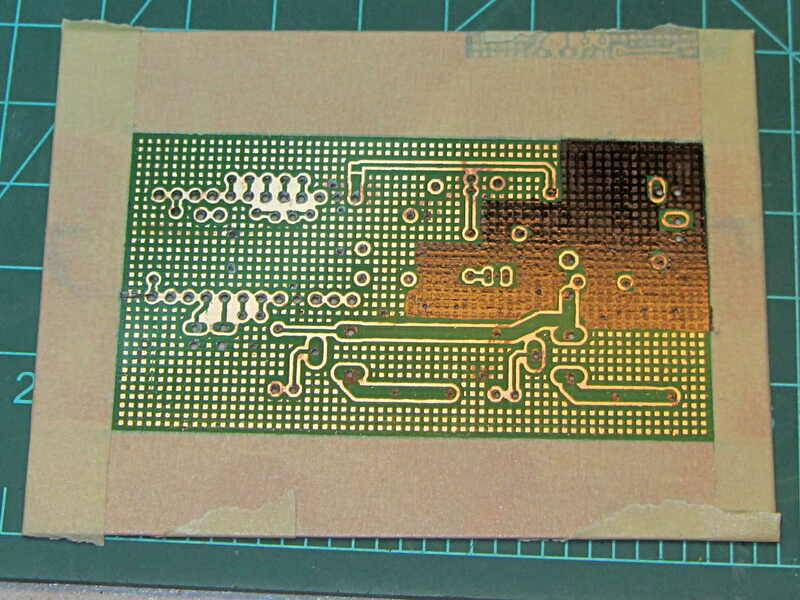 That’s less than the usual time, which suggests the PCB is plated with half-ounce copper (that’s 0.5 ounce / ft2), rather than the one-ounce copper on the other boards I’ve done recently; just one of the hazards of buying surplus PCB stock. Doesn’t really matter, as the peak currents will be under half an amp and now I know not to use this batch of raw board stock for high current circuits. All in all, it looks good enough. Now, for some component soldering. The mouse being out and about at the time, I dumped the nest (which was just a foundation) over the patio railing into the flower garden, burned out the remainder at full throttle, and continued the mission. 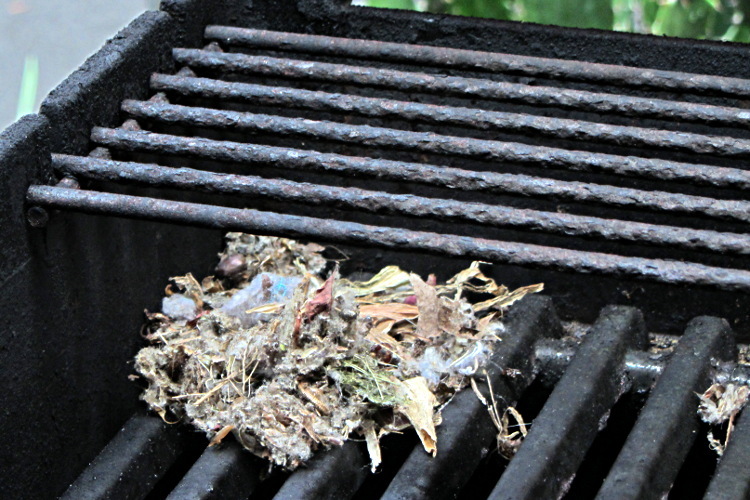 Once again, I dumped the nest over the railing, burned out the rest, and continued the mission. As of three weeks later, the mouse hasn’t returned; I trust it found a hollow log somewhere out back. 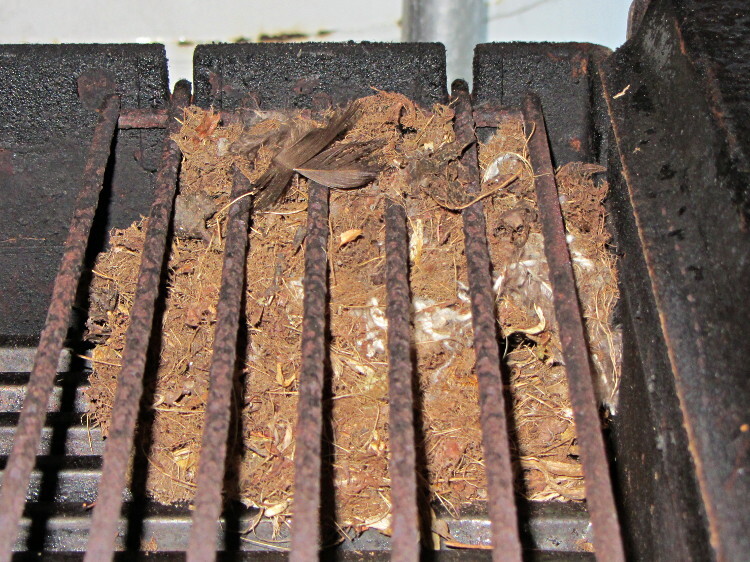 As nearly as I can tell, the mouse climbed up a square steel leg, scampered through the grease catch pan, leaped up through the drain hole, wriggled through three layers of crossed bars, and then deposited a single mouthful of building material. 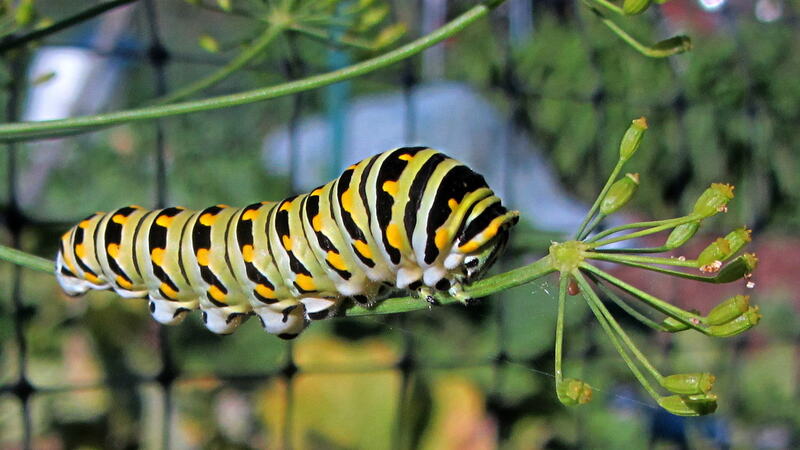 Amazingly, they turn into Black Swallowtail butterflies that sometimes visit the Butterfly Bush outside our living room window. Well, maybe not this one, but certainly some of its relatives. We don’t hassle them; they have a fearsome threat display that apparently works wonders on their natural predators. 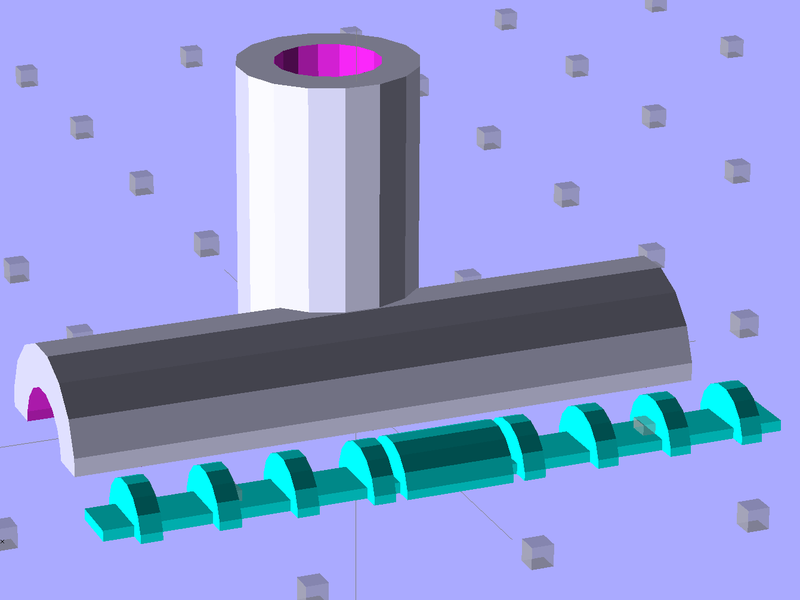 This intensive course will bootstrap you into designing solid models of useful objects suitable for production on a 3D printer. Num = floor(90/asin(HoleDia/RingDia));	// how many holes fit in ring? The 36 V 350 W power brick for the improved M2 HBP arrived and seems to work fine, apart from a distinct smell of hot electronics under load. Dialed back to 30.1 V at the terminals (to match the HBP spec) and with the HBP connected through the same length of 12 AWG wire as before, the supply draws 150 W from the AC line. It draws 160 W at 31.7 V and stabilizes at about 100 °C. The heater resistance is 7.6 Ω before it has a chance to cool off, so the heater runs at 4.17 A and 132 W. The supply efficiency is 83% = 132/160, about what you’d expect. The fan runs intermittently with that load. In order to dissipate 150 W in the panel at the same resistance, the voltage must be 33.5 V at 4.5 A. I’d want to install it in the M2 and make some measurements before jumping to any conclusions. So I think the brick will wind up at about 35 V to make up for the SSR drop. 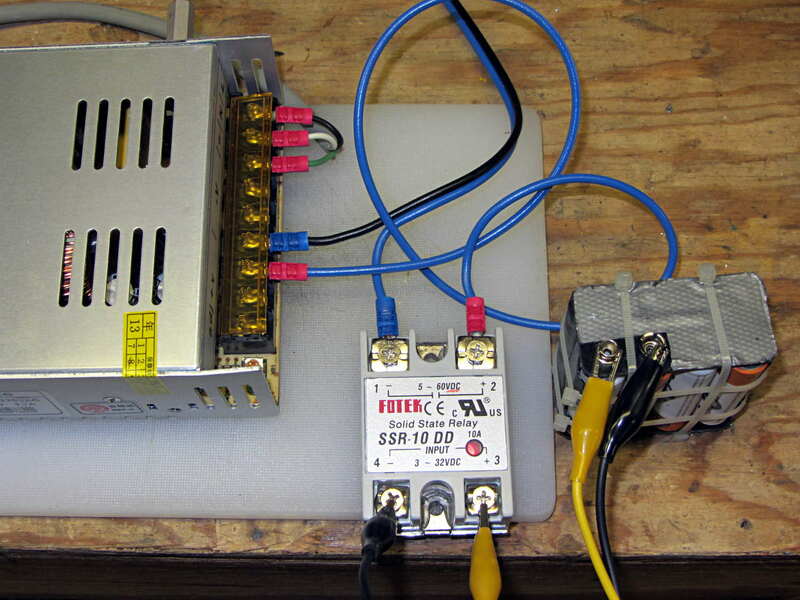 The SSR will dissipate about 5 W and won’t need much heatsinking; just bolting it to an aluminum chassis may suffice. After looking at all the holes in the maximum-size PCB platen for the Sherline mill, I started thinking about a vacuum table for things like PCBs and engraved slabs. That ought to be useful in a DIY vacuum table that needs a good, low-volume pump. It seems refrigeration pumps can get down around 29 inches of mercury, so the net pressure difference is maybe 13 psi and I’d round it down to 10 psi. Typical small PCBs, say 1 x 2 inches, would have 20 to 30 pounds of downforce. 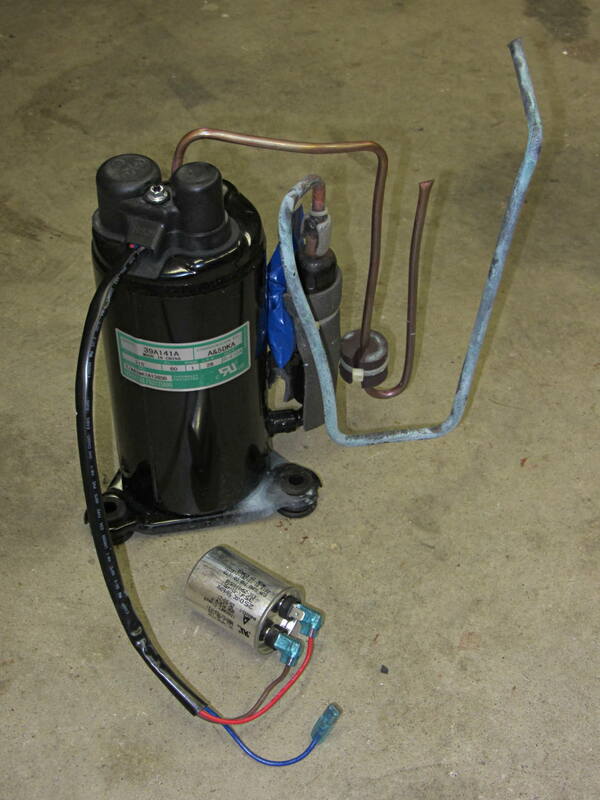 From what I read, the pump will blurp oil from the smaller outlet tube while settling down to pull a vacuum through the larger, rather discolored, inlet tube; adding a larger diameter vertical catch chamber with a splash plate to the outlet would be in order. I think a trash filter on the inlet, perhaps conjured from a defunct whole-house water filter with a 3 micron spun-fiber filter element, should keep dust and crud out of the compressor; the inlet already has a small filter / dryer (the lump next to the compressor body), but that probably won’t withstand an assault of glass-fiber-laden PCB drilling dust. As far as the vacuum table goes, I think a 3D printed base with a machinable wax insert might be just the ticket: the base collects all the complexity, including hose fittings and a plenum under the insert, into a 3D model where it’s easy to duplicate and the cheap-and-simple wax acts as a moderately hard sacrificial platform. The base would have 10-32 holes around the outside to match the Sherline’s tooling plate. The wax insert could stand proud of the base and have holes only where they’re needed, so the base holds the insert in place mostly by vacuum. 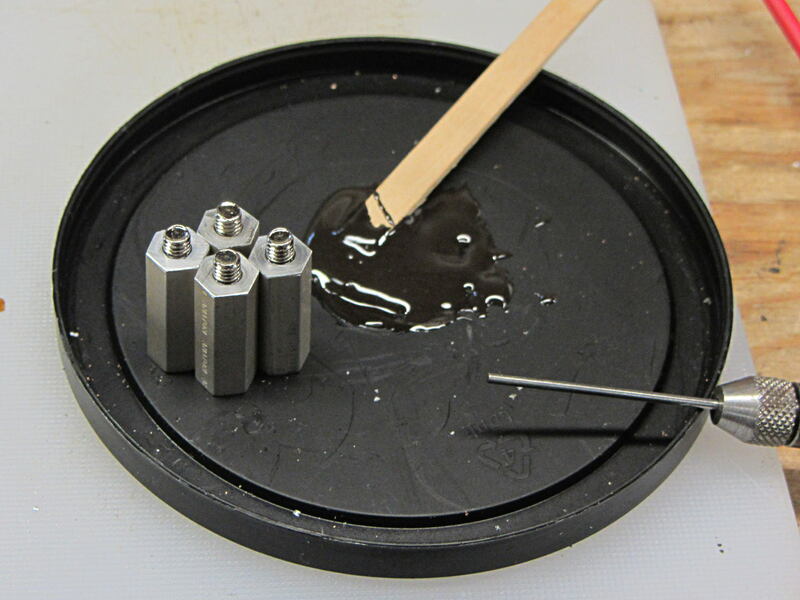 You’d (well, I’d) like to cast the wax in place, but it melts around 240 °F = 115 °C and gets pourable around 270 °F = 132 °C, well above the point where PLA gets juicy and about where ABS gets gummy, so I think a drop-in slab makes more sense; cast it on a plate for a flat bottom surface, trim off the mold flash, and drop it in place with the flat side down. Then, with the vacuum turned on, flycut the rumpled top to get a known-flat-and-true surface, mill some vacuum channels, and drill holes to match the 3D printed holes in the plenum; all that would be a G-Code routine, of course. A simple hexagonal drilled pattern (big shallow holes for maximum clamping, little through holes into the plenum) might be a good starting point, at least for the simple, low-stress stuff I’m doing: PCBs and maybe edge-lit ersatz Nixie tubes. You could gently heat the part to seal it to the wax, although that might risk losing the top surface alignment. 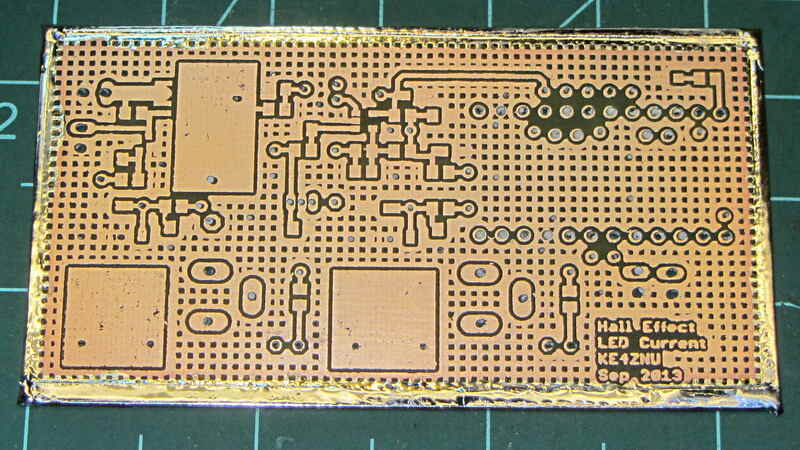 Given reasonably flat PCB material, a custom channel pattern under the board might be just as good. When the wax gets sufficiently chopped up that it can’t hold a good seal, toss it in the remelting bin, drop in a new slab, mill it to suit, and continue the mission. 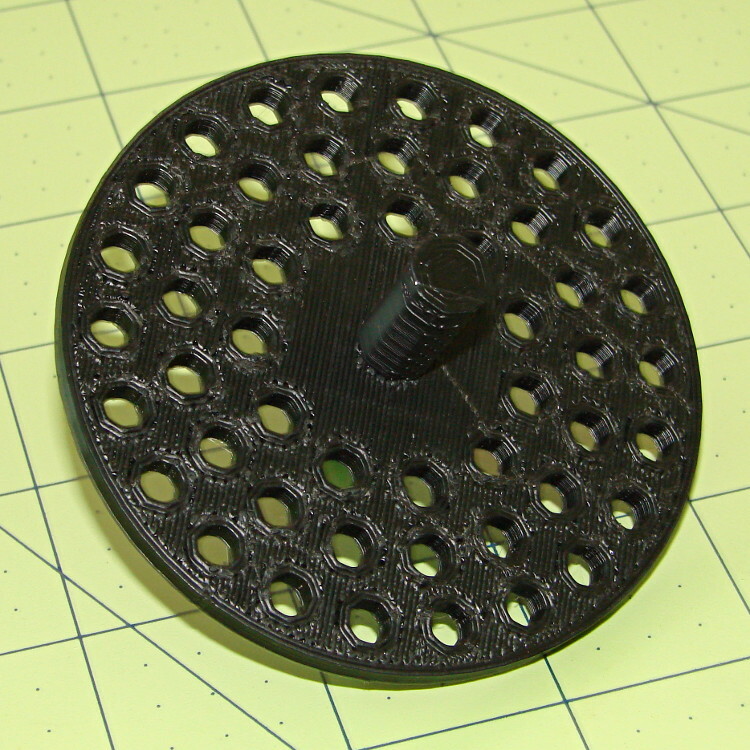 If you do it right, everything’s parametric and you can generate a custom base with a custom insert by twiddling a few parameters that set the overall size of the thing; print up the base, drop in a wax plate, machine the top surface, done. You’d need two source files: OpenSCAD for the base and custom G-Code for the insert. 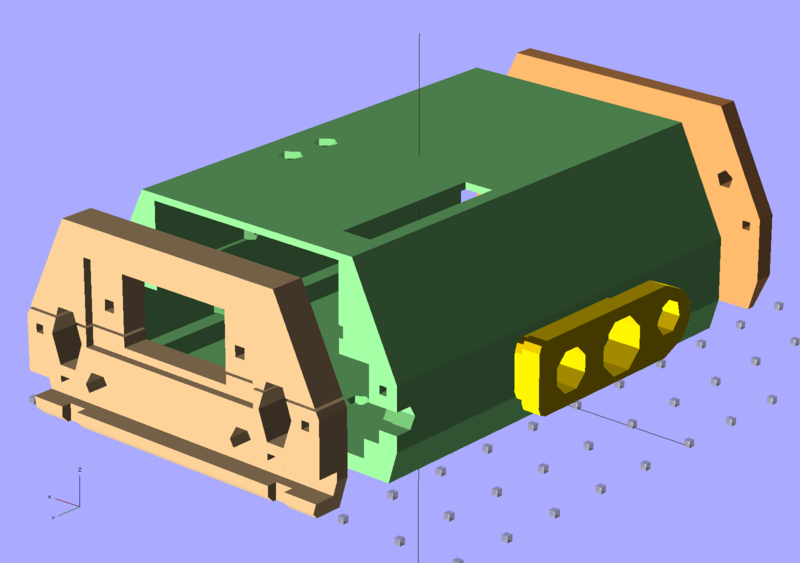 Maybe the OpenSCAD script can generate and export a DXF-ish file that could produce the mill / drill code for the insert.